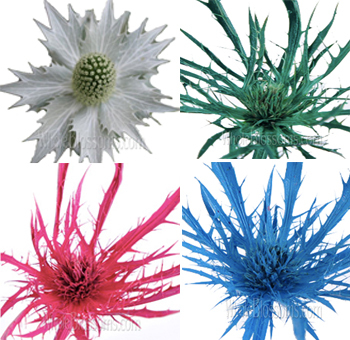 Thistle is a spiny flower that works as broad leaf filler, adding an exotic and unique look to DIY wedding flowers and floral centerpieces. It is characterized as having upward pointing leaves and stiff stems. It is available year round in a variety of natural and dyed colors to accent your wedding or special event. Due to its relatively long vase life, it is ideal for out of water arrangements and makes excellent dried flower following primary use. Thistle, in general, is the name given to a number of flowering plants characterized by leaves that are sharp and prickly. They mostly belong to the family of Asteraceae. The leaves are adapted like this so that the plant does not get eaten by herbivorous. The flowerheads of these plants are shaped like a cup or an urn. 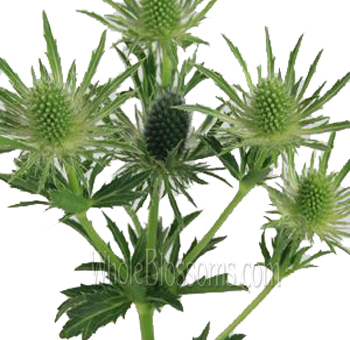 The thistle is a beautiful plant and actually is also the floral emblem of Lorraine and Scotland. It’s a plant that holds a lot of symbolism and meaning too. It represents nobility and grace fullness. The thistle Eryngium which is also commonly referred to as sea holly is a coarse and prickly summer bloom in an enchanting grey-blue color. The thistle like flowerheads arose from a branched stem and are generally egg-shaped with abundant tiny stemless violet-blue flowers growing on a single bloom. The name of this flower comes from the Ancient Greek name which was used for a plant in Greece by Theophrastus. It can also be a reference to the sharp and spiny nature of the flowers and plants in general. 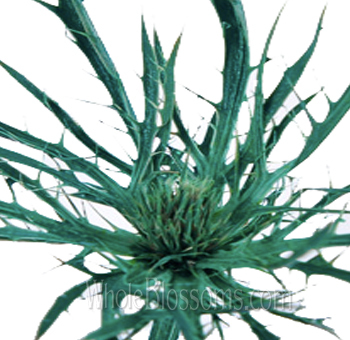 The beautiful sea holly usually flowers between the months of July and September. The plant is very sturdy, hardy and robust. It can face drought, winds and salt sprays. The beauty of this plant is that it changes colors throughout its growth. They go from a steal blue to green and then a lovely autumnal dark chocolate. They look especially lovely when dried too. They are usually found in Europe and the Mediterranean. It's prickly leaves and flowers deters away any herbivorous animals grazing around their patch. 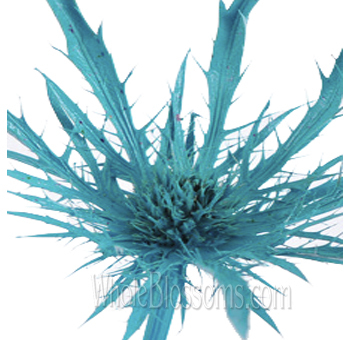 The Eryngium has at-least two hundred and twenty species to its name. The alpine sea holly and the amethyst sea holly are the loveliest. They can be found in Switzerland and are the bluest in color. This beautiful color looks absolutely stunning in flower arrangements. Think ivory flowers and blue thistle wedding bouquet is justa breath-taking combination for any bridal bouquet. The beauty of this flower and popularity in floral arrangements has led to different hybrids and cultivars. They are grown in nurseries in a lot of places in the country and come in a wide range of colors. 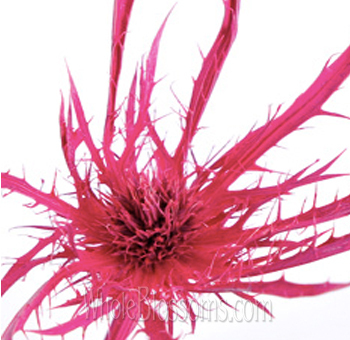 Red and pink thistle are just as beautiful as the violet-blue ones. There are even white thistle flowers available for a classic all-white bouquet. 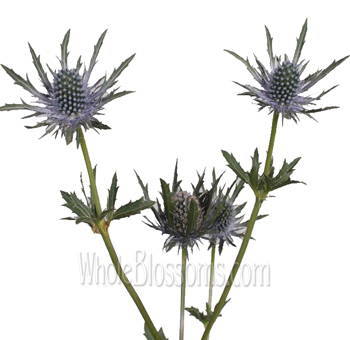 The thistle flower is a thing of absolute beauty in all kinds of floral arrangements. They are increasingly being used by brides in wedding décor. They have a real aristocratic charm when placed in bouquets. 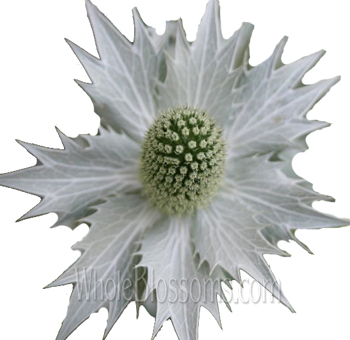 The blue Eryngium thistle goes amazingly well with ivory flowers. 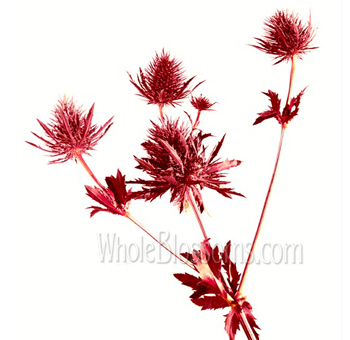 While the pink or red thistle flowers can be used in any bouquet. Lush peonies and garden roses along with red thistle flower will make a stunning and intriguing bouquet. This kind of floral arrangement will look good as a centerpiece too. There's just so much you can do with thistle. This beautiful flower comes in white too depending on the variety. White thistle can create a firm texture and structure to a classic white bouquet or even a soft-hued orange or coral bouquet. Thistle can work as a boutonnière for the grooms and men too. It's a little different from the classic choice of carnations and roses. Adding thistle to your floral arrangement would definitely be an offbeat path. The beautiful thing is that although thistle is proactively used in wedding décor, it can also be used for Christmas. With Christmas around the corner, we highly suggest drying out thistle and using it in your Christmas wreaths and garlands. Thistle Maybe unscented and prickly but the flower has a unique look which is very attractive to the eye. 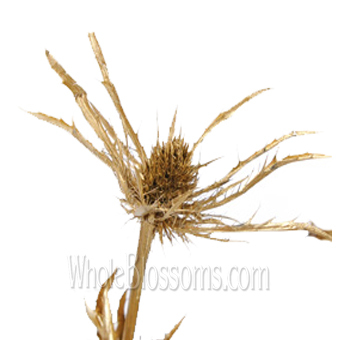 Thistle can shine well on their own but work best as companions to other flowers and leaves. Thistle is genuinely a lovely flower. 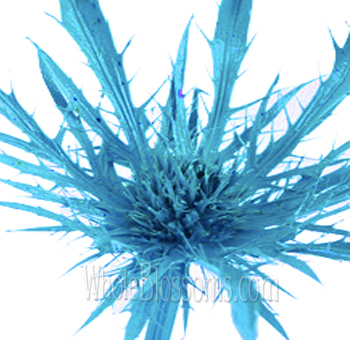 The beauty and uniqueness of the steel blue thistle are unmatched. They go well in literally all flower arrangements. Because of this, you might want to buy them bulk. They can be not only a part of your bridal bouquet but also the groom's boutonnieres and in centerpieces or mantelpiece decorations. Add them to your wedding arch too for a dramatic look. That's why buying bulk from online wholesalers is much better than running around town from florist to florist. 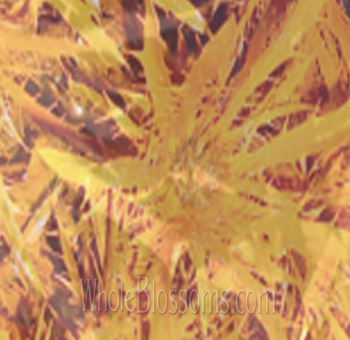 We highly suggest a renowned online flower wholesaler called Whole Blossoms. They can cater to all your flower needs. They deliver right to your doorstep and even have a 24/7 hour delivery system which is a relief for event planners and even do it yourself brides. They have a variety of thistle flowers for sale on their easy to navigate website. 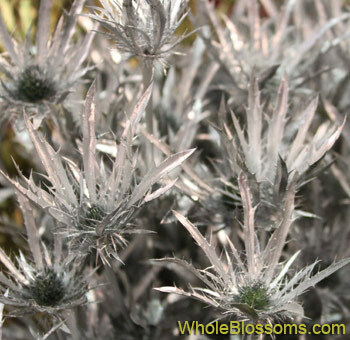 Your beautiful thistle blooms are just a click away!